Anybody that knows anything about me knows how cheap I am. I’ll spend money at the parts store or the junkyard, but not a lot. Back at home, I’m bad to lean on friends to help me with my various projects, although I try to pay them back in kind. 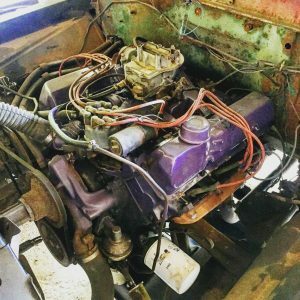 So you can imagine how much it pains me to have spent over $1,500 so far on a simple valve job on a rusty 1965 Ford pickup project. The pain was literal and physical. One afternoon when I was kind of stalled out on some other projects, I did a compression check on the engine and found two dead cylinders, one on each side. So I decided to do a quick valve job. 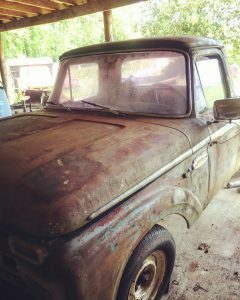 The truck has a 352 engine in it, and those engines have intake manifolds that weigh about 80 pounds. The cylinder heads are far lighter by comparison. It all went well until I went to life that intake over the fender and felt something hurting in my gut. Hoping it was just a pulled muscle or something, I didn’t do anything about it immediately. Finally I went to the doctor, who said I had a hernia. They also checked for other issues, which scared the wits out of me, but after numerous trips and several hundred dollars out of pocket it turned out the hernia was the main problem. I had it fixed on Wednesday. It was first time I’d ever had surgery, so that was an all-new experience. Costly too. Today (Friday), things seem to be going fine. Back to the 352. My friend Charles Warr did the heads for me, and we got the valves, guides, gaskets and such from Matt’s dad, Scott Dooley, at Scott’s Auto Machine. After swapping some push rods to accommodate the new valves, the engine runs great. Charles did some research to see what the correct color was for the valve covers. We were discussing it on the phone when Charles’ wife Audrey suggested we paint them purple. Surprisingly, parts stores do sell purple engine paint, so that’s what I used. I got a brake job done before the surgery, so when my driving restrictions end, you can guess what I’ll drive on one of my first trips.